It has been a long time coming but we can finally and officially tell the world the outcome of our Ofsted inspection! I'm proud to say we have moved up into the 'requires improvement' category. The pace we have moved since Ofsted left has been relentless as we work together on our journey of improvement. However, I urge you to draw breath, have a read of the report, and reflect on the incredible work we have all done to get to this point. Finally, in the spirit of continuing to learn and improve, let me draw your attention to two events below that I hope you have signed up for - our Putting Practice First conference and the Digital Days workshops. A series of dynamic and engaging children, young people and adult practice focussed events takes place next week. Putting Practice First, from June 26-30, is inviting social work and children’s services professionals from Coventry and all over the country to take part in a series of events and workshops. One of the events will be Knocking on the door – a play focusing on a child protection home visit and a workshop looking at how practitioners work with men in early help and child protection. The play is a collaboration between Geese Theatre and leading social work academic and author Professor Harry Ferguson and will merge a traditional key-note lecture with vivid theatre performances. The Leadership team has agreed to implement a new permanency planning tracking process for looked after children following feedback from the recent Ofsted inspection. These arrangements are due to commence in July 2017 (date to be agreed) and are designed to provide sufficient oversight and timely decision making and action leading to the achievement of legal and emotional security at the earliest possible point. This will mean a minor change to the remit of the existing weekly Legal Planning Meetings, and two new panels will be introduced that follow the child’s journey through to permanence. This also means that some existing panels will be disbanded, including CPOP, Care Prevention Panel and the Children’s Social Care Resource Panel, to avoid duplication. Apart from the stage 1 panel, the other 2 new panels (stage 2 and stage 3) will be piloted in the first instance. The pilot will run from July to September 2017 before they are rolled out across the City. The pilot area will be all cases in the North East Neighbourhood. Ensure that permanency planning for children is progressed with the pace and urgency that is needed, including achieving legal or emotional security for children and young people. Improve the timeliness and the quality of evidence for court work, including pre-proceedings work. This should also include ensuring assessments of connected persons are timely and robust and those children and their carers receive appropriate support. Ensure that children are prepared well for moving to their permanent home, including starting life story work at an earlier stage. You must ensure that you are clear what the purpose of your attendance at these panels are and come prepared with the right paperwork. Your managers should be discussing the remit of these panels with you in detail so if you haven’t heard anything about this, then please ask your team manager to talk to you about this. There will soon be a central place to go to find out what services are available for practitioners to access in children’s services with a link to the Documents Library to access the referral form for the service that you need. The Menu of Services will briefly describe the service on offer, what the criteria for access is, and how to make a referral. Further information about this and the link will be available shortly. 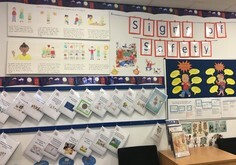 Children & Families First Service (North East) have put together a brilliant interactive display board encouraging practitioners to have a go with the Signs of Safety (SoS) approach. Signs of Safety is our expected way of working to help improve how we work with families. It helps everyone involved with a child/young person – including the child/young person themselves – to think about ways to keep safe, healthy and settled, wherever they are living. Team Manager Bharti Patel said: “This has helped us to change our way of thinking to truly understand the importance of working together to build a culture of transparency so parents / carers know exactly why Early Help is working with the child’s experience for positive results during our involvement and to take ownership of the exit plan. Are you nervous about using technology? Are you confused by all the terms? Do you want to understand more about some of the key technology we use? If you answered yes to any of the above, a series of digital days are being offered, specifically for staff in Children's Services who would like to increase their understanding of ICT and the digital agenda. Each session will be 45 minutes long, they will be informal and interactive, giving the opportunity for you and colleagues to ask questions and provide feedback. Please ensure you get approval from your line manager before booking onto one of the sessions. Did you know you can keep track of your CPD, bookmark your favourite resources and save items to read ? There are CPD, FAVOURITES and READ LATER buttons at the top of all resources and learning events pages. Click to add the item to the relevant section in MyRiP and automatically update your brand new CPD log, bookmark items you use often, or store information you want to come back to later. Click on “create an account” and create your log in using your Coventry email address. Anyone working in children’s services can use this resource including students in placements. VOC head to Buckingham Palace! Two of the city’s inspirational young people had the honour of being invited to a Buckingham Palace garden party in June to celebrate their work with Voices of Care. Danielle said: Well what can I say! Yesterday will not be a day I forget in a hurry! Spent an amazing day with amazing people. When I joined the Voices of Care group I never thought I would end up chairing such an amazing group and meeting so many influential children, young people and professionals and never thought I would be given the opportunities I have been given at such a young age! I have had a blast with the group working on so many projects with them including filming, interviewing and making positive changes for the children and young people of Coventry to help make what is a horrible time in a young person’s life the best it can possibly be! Yesterday was an amazing day and a brilliant way of bringing my Voices of Care journey to an end! It is crazy to think the group has seen me grow up from the spoilt little kid I was into the woman I am and I could not have done it without the help of the group which has made me strive more to make many more changes for not only the young people of Coventry but also the future young people I will be working with in Sheffield! I have not made friends in this group, I have made another family! 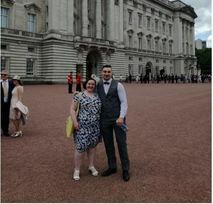 Jamal said: Had such an amazing day at Buckingham palace yesterday, beautiful weather and amazing people. When I first joined the Voices of Care Council and started working to improve the care system in Coventry never in my wildest dreams did I think it would take me to the Queens gaff!! I have been lucky enough to be part of some amazing pieces of work that impacts on the lives of looked after children every day. I have met some amazing people over the years, including people I would have probably never even crossed paths with had it not been for the work I love to do. I have also had the pleasure to get to know so many amazing children, who, although they have been through horrendous things and it seems the world is stacked against them, come with such a positive outlook on life and so determined to get to where they want to be. Looked after children are some of the most resilient, genuine and most deserving young people I have ever worked with. At the same time they are striving to achieve the same as their peers, all while having to deal with moving foster placements, constantly reliving their worst experiences with professionals, having to manage their own money, in some cases looking after a home of their own at 15/16. We still live in a society that see's looked after children as "naughty kids" and judges them before knowing their story. Instead they should be seen as the strong willed, independent young people who are powering through adversity to achieve! “One of the roles of the LSCB is to ensure that the partners that make up the Board are working together effectively to keep children safe. To help us do that we want to know about safeguarding practice directly from the professionals who deliver services to children and families across Coventry. So, we are inviting practitioners to complete this survey by 12th July. Coventry City Council is participating in a research study with Eleanor Lutman-White from the University of Warwick as part of her PhD degree. The research will explore how decisions are made in child protection conferences. Sam Sharkey and Lee Pardy-Mclaughlin are supporting Eleanor with the research. This study will focus in particular on child neglect. Neglect is the most commonly recorded type of maltreatment, yet cases involving child neglect are often complex and can be challenging for social workers and other professionals to work with. Every day, decisions are made by professionals working with neglect, however research rarely considers how decisions are made in cases of neglect. The research will explore the process of discussion and decision-making in a small sample of initial child protection conferences held because of concerns about neglect. In particular, it will examine how the judgements and assessments of social workers and other professionals, as well as the views of family members, affect the process and outcome of the conference. The findings of this research will provide direct examples and evidence of how the complexities of neglect are managed and how judgements and decisions are made in a multi-professional context. At the end of the research Eleanor will work with Coventry City Council to feed back the findings to professionals. This good practice guide, produced by Community Care Inform provides a useful update and refresher on attachment minded practice with children, young people and their families. It will be relevant for all our children’s services practitioners. Please do share in your teams, and take time to read it yourself. As a part of the move towards developing a Social Work Academy, Anne Winn is coordinating a Student Unit which provides a programme of 9 workshops to enhance student’s development whilst on placement. The programme reflects the child’s journey, embedding learning aligned to the Knowledge and Skills Statements and offers an opportunity for students to critically reflect on their practice and share their learning from their placement settings across the service. At the start of this initiative in September 2016, Senior Practitioners, Natasha Stirling and Laura Bass were involved in the design and development of the workshops. From February for the new student intake, Natasha has provided key input around understanding thresholds; working in partnership with families and looking at lessons from SCRs. Senior Practitioner, Laura Hooper, Team Manager, Louise Paterson and University Lecturer, Luke Tibbits have provided lively, interactive and informative workshops in: Direct Work with Children, Undertaking Assessments and Linking Theory to Practice. Most recently Xandra Gilchrist and Dhirendra Shrivastava provided a packed and passionate journey around how crucial the role of foster carers is in providing the caring environment for children to flourish and our role in supporting them in this. Students have commented that the workshops have been a great opportunity to meet together and discuss the challenges of social work practice, sharing ideas about different ways to support families. “The workshops have been fantastic at giving us time with experienced practitioners to learn new skills and reflect on our practice”. The focus has been on students actively participating in the sessions, providing valuable group learning and support during, what can be, a very challenging period in a student’s preparation for a career in social work. Another exciting development has been our contribution to the ‘Think Ahead’ programme that is running in Coventry’s Adult Services. This a fast track programme to train social work graduates to become mental health social workers. The 4 students on the Coventry programme have been provided with contrasting 30 day placements within our Referral and Assessment Team and North East Children and Families First Team. It is has been very successful in building a better understanding and encouraging a closer working relationship between Children’s and Mental Health services. The students have found this a really valuable experience. One student commented: "This placement has really given me a great insight into Children’s work to inform my work in mental health”. Now the Ofsted inspection is over, I’m feeling calm and reflective. Do I have the energy to keep up the pace that has taken us this far on the journey of improvement? Yes of course I do! I am more confident than ever, plus I feel a moral imperative to provide the best life chances to every single child and young person that we serve. I don’t know what I would have done without my Coach, Sarah, who has helped me to stay strong and resilient through some turbulent times in Coventry. I must reconnect with her to help me with this next phase of the journey. Having a Coach is actually pretty cool. Talking things through with Sarah has enabled me to be clear about my future development needs and direction. On an individual level it has enabled me to further develop my leadership skills, and increase my confidence in these areas. On an organisational level I've been able to complete complex management tasks with greater ease and confidence. I really feel like I was stretched by Sarah and now have so many new ways of thinking about doing things. I actually sat and jotted down loads of notes in my car after the session so I didn't forget them after I saw her last. Anyway, I am meeting with Sarah again in the next couple of months. I remember not being totally convinced about Coaching when I first had some information about it, but I’m sold on it now!. It’s okay to ask for help to address a challenge or even just a dilemma that is swirling around and nagging through that little voice in the head. Professional coaching brings many wonderful benefits: fresh perspectives on personal challenges, enhanced decision-making skills, greater interpersonal effectiveness, and increased confidence. And, the list does not end there. The Foster Care Learning and Development Portfolio has been updated for 2017 and includes some great new courses. The Portfolio shows all the aims and outcomes for the sessions and how to book. Some of the new dates are for Life Story Work, Prevent Awareness and Substance Abuse. There are some new e-learning packages for Equality & Diversity and Behaviour Management. Email gareth.lewis@coventry.gov.uk with your updates, comments or suggestions. As at 31 May 2017, 6 children adopted, 0 children have been placed with adopters with no adoption orders. 6 applications lodged with the court since April 2017.